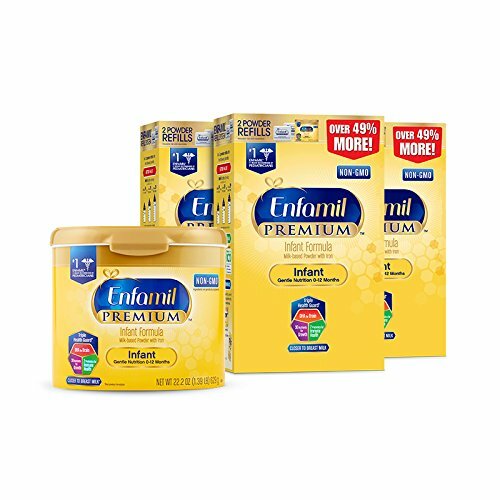 Enfamil PREMIUM Infant Formula is backed by decades of research on breast milk and multiple clinical studies on its brain building power. It is tailored to meet the nutritional needs of all infant through 12 months, and has an easy-to-digest blend inspired by breast milk. It's unique Triple Health Guard blend has 30 nutrients for growth, DHA to help maximize learning potential and an exclusive prebiotics blend clinically proven to support the immune system. *** Expert recommended level of DHA is .2%-.5% of total fatty acids. Enfamil Premium level is .32%.